Elkann: "I've always known Fiat's life was very precarious." MILAN (Bloomberg) -- While Fiat CEO Sergio Marchionne, 61, got the spotlight for the New Year's Day swoop to secure full control of Chrysler Group, a reserved 37-year-old will ultimately determine whether that transatlantic combination succeeds. 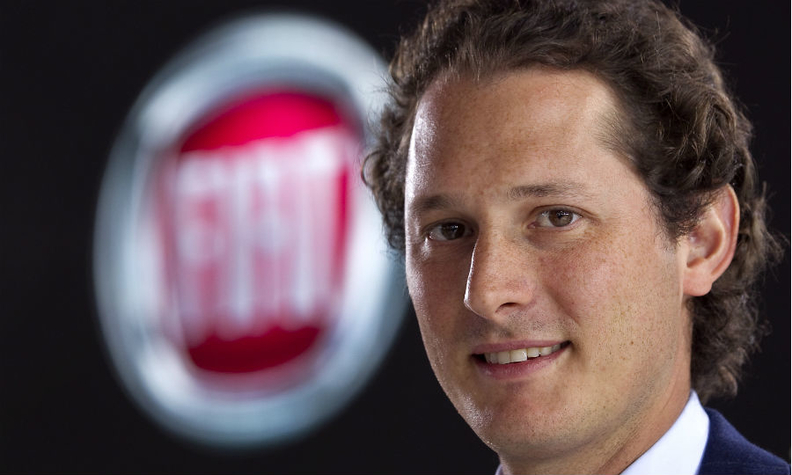 John Elkann, born in New York and raised in the UK, Brazil, France and Italy, is the reigning heir of the Agnelli family, the Italian industrial clan that's controlled Fiat for 115 years. The young chairman, who's already been on the job for a decade, is in position to steer what's become the world's seventh-largest carmaker for years to come. His global approach is already evident. Fiat is due to complete the purchase of a 41.5 percent stake in Chrysler as early as today, capping a five-year effort to gain full ownership of the No. 3 U.S. automaker. The Italian company will discuss merger terms later this month to seal the transformation of Fiat from a Europe-focused manufacturer into a viable competitor to General Motors Co., Toyota Motor Corp. and Volkswagen Group. "Elkann's not conditioned by the past and is moving the company into a more global direction," said Giuseppe Berta, a professor at Bocconi University who used to be head of Fiat's archives and knows Elkann personally. "John wants to leave a mark likes his grandfather did. He represents a real generational shift." To underscore the change in the company's center of gravity, Marchionne favors a U.S. headquarters and New York listing for the combined entity. Elkann said this week that Marchionne, the CEO of both Fiat and Chrysler, will stay at least three more years to further the integration. While the deal with Chrysler broadens Fiat's options, Elkann still needs to bolster an undersized presence in China, implement a 9 billion-euro ($12 billion) plan to turn around an unprofitable European business and ultimately select a replacement for Marchionne, a deal-making savant who saved Fiat from bankruptcy. The Turin-based company invested about $3.7 billion in cash to take over Chrysler in the five-year process. That's about a 10th the $36 billion Daimler paid for the company in 1998. While Marchionne was jetting between Italy and the U.S. to strike the Jan. 1 deal to buy the final stake from a union health-care trust, Elkann played an active role, keeping an open line with the hard-driving CEO from his office on the fourth floor of Fiat's Lingotto headquarters. The two then flew together to attend the Detroit auto show this week, with Elkann appearing there at a press conference with Marchionne. He stood out from other showgoers, sporting a heavy dark suit, white shirt and bright-red sweater vest. "I am very happy to be here," Elkann told journalists at the Detroit briefing, a rare public appearance in the U.S. "I've always known Fiat's life was very precarious. Today, I know we have a future that is much more positive than what we could have dreamed of some years ago." Hiring Marchionne -- an auto-industry rookie, who was toiling away in relative obscurity as head of Swiss testing company SGS -- was Elkann's biggest coup. Shortly after joining Fiat in 2004, Marchionne turned a failed partnership with GM into a $2 billion payout, giving the Italian company breathing room to develop the trendy 500 city car. While the outspoken Marchionne, who's publicly sparred with VW Chairman Ferdinand Piech over his interest in Fiat's Alfa Romeo brand, would seem to clash with Elkann's refined restraint, the two share a common understanding. Both have cosmopolitan upbringings -- Italian-born Marchionne grew up in Canada and lived for years in Geneva -- helping them agree that Fiat needed to look beyond Italy to solve its woes. Elkann, who is also CEO of Exor, the Agnelli family's investment company, has sought similar global citizens for other key posts. In 2012, he appointed Shahriar Tadjbakhsh, a Swiss-born American with Iranian roots, as Exor's chief operating officer. That international approach sets him apart from past patriarchs of the family. "Elkann was clearly right" to make Fiat more global, said Andrea Giuricin, a business professor at the University of Milan Bicocca. "With its American deal, Fiat saved itself from the mistakes made by the Agnelli family in the past." As the grandson of Gianni Agnelli, who built Fiat into Italy's biggest manufacturer, Elkann was groomed at a young age to take over the family business, including stints working anonymously on factory lines in Poland and the UK. Appointed to Fiat's board at just 21, he was selected in part because there were few other options. Gianni's only son Edoardo died in 2000, while Elkann's younger brother Lapo has battled drug problems. Umberto Agnelli, John's uncle, died in 2004, a year after Gianni's death, forcing the then 28-year-old to take responsibility for the company. Since then, Fiat reduced its dependence on the saturated European market to 24 percent of revenue in 2012 from more than 90 percent. Sales more than tripled to 84 billion euros, thanks largely to buying a majority of Chrysler. That success gained him recognition outside the family. News Corp. appointed Elkann to its board last year. Still, Italy's declining role has caused tensions at home. "The Agnellis are leaving Italy, and what is left of the family has an attitude I don't like," Diego Della Valle, founder of leather-goods maker Tod's, said in a Jan. 12 interview with broadcaster RAI. "Fiat has gotten everything it wanted from Italy. They should now give something back." In addition to controlling Fiat with a 30 percent stake, the 250-member Agnelli clan's Exor holding owns 27 percent of Fiat's truck and tractor affiliate CNH Industrial, 69 percent of real-estate company Cushman & Wakefield, 64 percent of the Juventus soccer club, and 4.7 percent of The Economist. Elkann, known as Jaki to family members, is Gianni's eldest grandchild and the son of his daughter Margherita and Alain Elkann, a French-Italian writer. An avid sailor and soccer player, Elkann is tall and thin with tousled dark hair and a boyish smile. When he speaks, which isn't often in public, his delivery is slow and deliberate as if he's weighing each word. He's married to aristocrat Lavinia Borromeo and has three kids named using the Italian words for lion, ocean and life. In Detroit, Elkann said that Marchionne will stick around to see out the European turnaround plan, putting off the decision on an eventual successor as they work to further internationalize the former icon of Italian industry. That means the two will continue a journey started over dinner and a Grappa on the shores of Lake Geneva in 2004. "Since that dinner, not much has changed about the way we think about the business," Elkann said in a speech at Milan's Bocconi University in June. "I do think the combination of having a very strong leader for the business combined with a strong family backing works."